Welcome to CFO.University’s audio version of Robert Baker’s CFO Ed Talk, The Link between Leadership and Sustainable Success. Robert invites you to learn how to build long-term sustainable success and a team that everyone will want to join. I’d like to invite you to join a hypothetical team. But I’ve got to warn you, we’re not doing so great. We work 10-12 hours a day, sometimes six or seven days a week. But we’re not hitting any of our goals. In fact, relationships are breaking down. There’s lots of blame going on all around and morale is at an all-time low. Is that a team that you want to join? Do you want to join the team that’s not complete, not empowered; a team without clear communication of strategy and/or results; a team lacking the celebration of success? No, I didn’t think so. I believe that all people want to win. But it’s not about beating the competition. It’s about coming together with a group of people, agreeing upon goals and then accomplishing them, succeeding. I believe that breeds more success. We can create sustainable, successful teams by creating an environment where teams can win. The first step in creating that environment is to build the team. 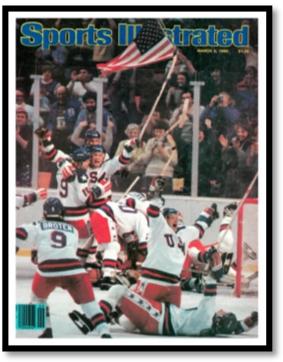 When Herb Brooks was appointed the head coach of the U.S. Olympic hockey team in 1980, everyone thought he would go around the country selecting marquee players from each position, but he didn’t. He actually assembled his team from a group of relatively unknown college players, but these guys knew how to play together as a team. They had defense, scoringand goaltending. They had coaching and they had tenacity. They had the whole package. Resource Investigator. Somebody who’s really good at going inside and outside the organization, pulling together resources needed to accomplish the task. And then, there’s the all-important Finisher, the critical element to any team. This person is really good at finishing up the fine details needed to make sure that action sticks. There are nine different roles prescribed by the Belbin test. That doesn’t mean you have to have nine people on your team. In fact, most people play two or even three different roles. If you don’t have all those roles represented on your team, then you need to think about how you’re going to close that gap. Are you going to bring more people on your team or is somebody on the team going to step up and fulfil that role? 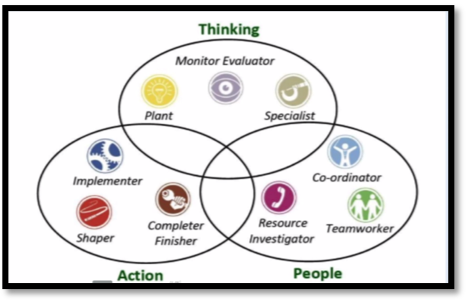 So equally important as understanding how complete your team is, the Belbin test also helps everyone on the team understand what their role is. That really changes the way you work together as a team. Having created the team, the next step is empowerment. It’s really important that every person on the team owns the successes and failures. Each person on the team should be encouraged, actually required, to speak up, speak their mind and do everything they can to create the highest quality product for the team. 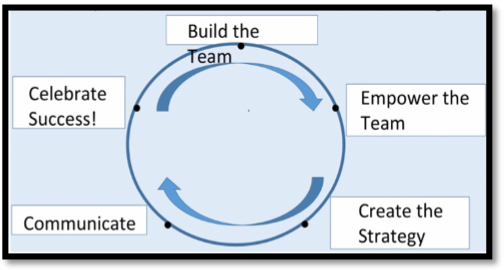 When your team emerges from behind closed doors, everyone will beunited and aligned around the strategy and what their role is in accomplishing that task. They own the success or failure of the team. Having empowered your team, it’s time to create the strategy. This is done with your team. It’s the team’s strategy to own, create and communicate. Strategy is one of the most overused words in the business language. We have a strategy for growing sales; we have a strategy for cutting costs; we’re going to cut out the competition and conquer this market. But you know, without a well thought out critical SWOT (Strengths, Weaknesses, Opportunities and Threats) Analysis no strategy is complete. 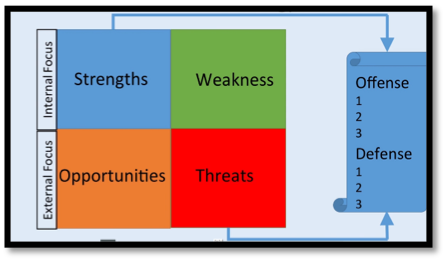 A SWOT Analysis involves looking at your company; internally at its strengths and weaknesses and externally at its opportunities and threats. Your strengths might include access to low-cost labor or raw materials. Perhaps you have a technological innovation, a patent or trademark. Weaknesses might mean high cost. The high cost of materials, labor or perhaps it’s a lack of capacity. Opportunities frequently focus outside of your organization such as developing new products or markets. They involve opportunities for growth. There are several different ways to segment your market and identify opportunity for growth; for example, a geographic expansion, a new product line or maybe an innovation that one of your suppliers makes available to you. Threats, on the other hand, come from the competition. This is where your competitors are using their strengths to come after your weaknesses. What piece of your pie are they trying to take? By combining your strengths and your opportunities you can create offensive plays, strategies that are going to lead to expanding your market share and increasing profitability. By analysing your weaknesses and your threats you can create defensive plays to prevent to competitors from eating away at your share of the market and profits. Having completed that strategy, it’s time to communicate. If we look at the sport of rowing there’s a position known as the Coxswain. The Coxswain is a person that sits at the back of the boat. They alone are looking forward. They are the only person who has an eye on the goal of the team. The team depends upon the Coxswain to steer the boat so they travel the shortest distance in the least amount of time. The organization depends on the leader and the leadership team to identify where they are going. How do you take that strategy and turn it into a very clear vision of where you’re going and how you are going to get there? The other role of the Coxswain is to control the engine of the boat. 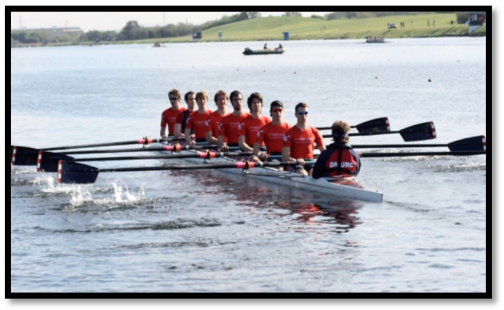 The engine of the boat is represented by the other eight members of the team that are doing the rowing. The Coxswain does this by signalling a strokecount to the first person in the boat and each of the other team members follows that stroke. The Coxswain can turn up the stroke count. They will keep an eye on the competition, look at the environment, the stream, the current and determine what’s necessary for their team to win. In fact, that team depends on the Coxswain to let them know what it takes to win. Likewise, your organization and leadership team are looking towards you to help them understand just what’s necessary. Where are we behind? Where are we doing well? Where do we need to put forth more effort? I have found the best way to do that is with a simple color-coded scoreboard. Taking no more than 10 metrics that represent the way your strategy will be achieved and then providing regular feedback, at least on a monthly basis, of how you’re doing for those metrics. If you’re not hitting the metrics the color is red. If you’re close, but not quite there, it’s yellow. And if you’re achieving your objective, it’s green. Having communicated the results and provided feedback regularly throughout the year, there’s only one thing left to do and that is to celebrate success. It’s critical that for the closure of the project, that the team celebrates the success that’s been achieved. It’s equally important that you recognize the high performers. They have to be recognized across the organization for the accomplishments and their contributions to the goal. The cycle continues as we rebuild the team for the next iteration. You do that by building your bench with special attention to developing tomorrow’s leaders. Have tomorrow’s leaders use model to lead smaller teams in the organization. This exercise grows the person. When we grow the person, we grow the leader and that strengthens tomorrow’s leadership team. In summation, I believe we can build long-term sustainable success by creating an environment where teams can win. You might be thinking, well, I’m doing most of that. But if you’re not doing it all, then it’s not going to be sustainable. So, go home, look in the mirror and ask yourself are you doing everything you possibly can to create an environment where your teams can win? If not, you know what to do. Just do it. Robert is currently the Operations Manager at Novolex, Inc. and is responsible for the Bagcraft – Vancouver manufacturing and supply chain operations. Bagcraft produces food service and industrial papers.